Vienna, 28 February 2019 – EHang and FACC, the Austrian aviation company, intend to take their air taxi to series production in Austria by 2020. They are adding a third partner, ProSiebenSat.1 PULS 4, to improve promotion of mobility of the future, as EHang Vice President Cora Tang, EHang Overseas Managing Director Felix Lee, FACC CEO Robert Machtlinger, and ProSiebenSat.1 PULS 4 CEO Markus Breitenecker announced during a press conference. Implementing any new mobility project requires the drive to innovate, the highest in precision, and suitable legal framework conditions, but it also takes public acceptance. 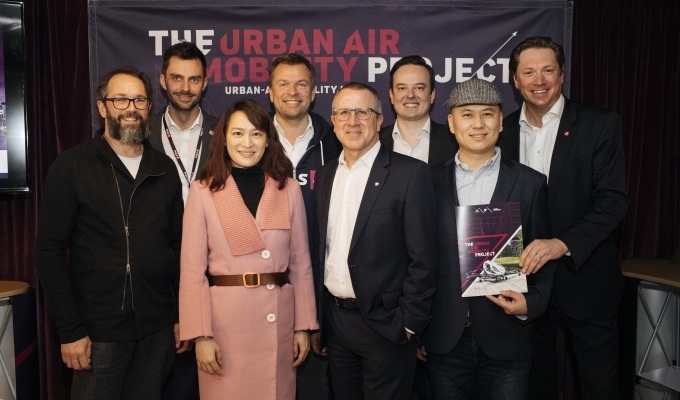 The three partners view themselves as pioneers of urban air mobility in Europe, which is why they are starting a broad public dialogue on the issue of mobility of the future now. The move is a logical progression in ProSiebenSat.1 PULS 4’s 4GAMECHANGERS strategy. At this year’s 4GAMECHANGERS Festival from 9 to 11 April in Vienna under the motto "Europe meets Asia", attendees will, for the first time, be able to go for a ride in EHang’s autonomous aerial vehicle (AAV). The three partners are united by the vision of jointly furthering the mobility systems of the future. The strategic cooperation between EHang and FACC is a big step towards assuming technology leadership in the area of urban air mobility. The addition of ProSiebenSat.1 PULS 4 takes the alliance a step further and marks the beginning of a discussion with all stakeholders. AAVs will be an essential component of that discussion. “The question is no longer whether there will be air taxis, but when. And we will be at the top of that industry,” Machtlinger says. Current studies show that the global market for passenger AAVs may grow to more than $2 billion by the middle of the next decade. Up to 100,000 air taxis are expected to be in service worldwide by 2025. Experts believe that autonomous flying will be practical even earlier than autonomous driving, since transit route design is much less complex. The three partners view the project as a chance for Austria and Europe as a whole to position themselves as pioneers. EHang and FACC are currently involved in active discussions with industry partners, politicians and aviation authorities in order to define the framework conditions and regulations for individual air traffic in Austria. In large metropolitan areas in particular, there is an increasing demand for fast modes of transportation without incurring traffic jams - our air taxis are an environmentally friendly and noise-reducing solution to this problem. EHang Founder and CEO Mr. Huazhi HU says, “An innovative, clean drive technology combined with the growing capabilities of digitalization allows us to implement completely new, highly efficient solutions in this area. Given stable 5G infrastructures, autonomous flying will soon be reality, offering customers a new dimension of convenience.” Within the partnership, EHang is the inventor and expert for all questions having to do with autonomous flying, especially with respect to connectivity and software solutions. The wish to create acceptance with regard to the subject of autonomous aircraft, is not only on the part of (inter)national authorities, but particularly among the general public. Mobility behaviour will change fundamentally in the coming decades – the age of individual air transport is approaching. At the same time, people are requiring more safety and an intact environment. In order to ensure the best possible communication on this topic, we have teamed up with ProSiebenSat.1 PULS 4, the successful media group in the DACH region will take over all public relations work, answer questions from the general public and highlight developments and opportunities for the future. The 4GAMECHANGERS Festival 2019 represents the starting gun for a broad media treatment in information, discussion, and docutainment formats on several broadcasters and on partner media. Continuously updated information on the project will be available on the platform www.urban-air-mobility.io.